In 2003, the divine greatness of Kalki Avatar and Kalkipuri Temple has been proved in Astrology. Limitless Eternal Divinity (Swayamboo Chaithanya) is inborn in Kalki. Divine powers of Brahma-Shiva-Vishnu (Thrimoorthi Chaithanya) exist in Kalki. The zodiac cancer reveals the Avatharakala (related to incarnation) and the highest position of Jupiter shows the divine way of working. 1 Swarnaprashna held on 7th & 8th April 2003 and Thamboolaprashna held on 20th June 2003. 2 Video of Important Divine Decision (Deva Vidhi)-Malayalam with English Subtitle. Swarnaprashna held on 7th & 8th April 2003 and Thamboolaprashna held on 20th June 2003. Main Astrologer (Daivangnan): Tanur Preman Panicker. Astrologers: Panambra Sashidhara Panicker and Sathyapalan Panicker. Video of Important Divine Decision (Deva Vidhi)-Malayalam with English Subtitle. Limitless Eternal Divinity (Swayamboo Chaithanya) is inborn in Kalki. Divinity is in Kalki. Where there is Kalki there is temple (Devasthanam). The change in places do not affect the inborn divinity of Kalki. Divine powers of Lord Brahma-Shiva-Vishnu (Thrimoorthi Chaithanyam) exist in Kalki. Kalki has extra ordinary powers because of the highest position of Jupiter. The importance of Jupiter must be specified particularly. The zodiac cancer reveals the Avatharakala (execution by Incarnation) and the highest position of Jupiter shows the divine way of working. Inborn divine knowledge of Kalki is proved in Swarnaprashanam. Shaiva-Vaishnava-Shaktheya divine powers is in Kalki. Kalki attained the wisdom and knowledge of Lord. Kalki is brahmin. Now Kalki have a temple (Kalkipuri Temple) and will become world famous (situated in the birth place). 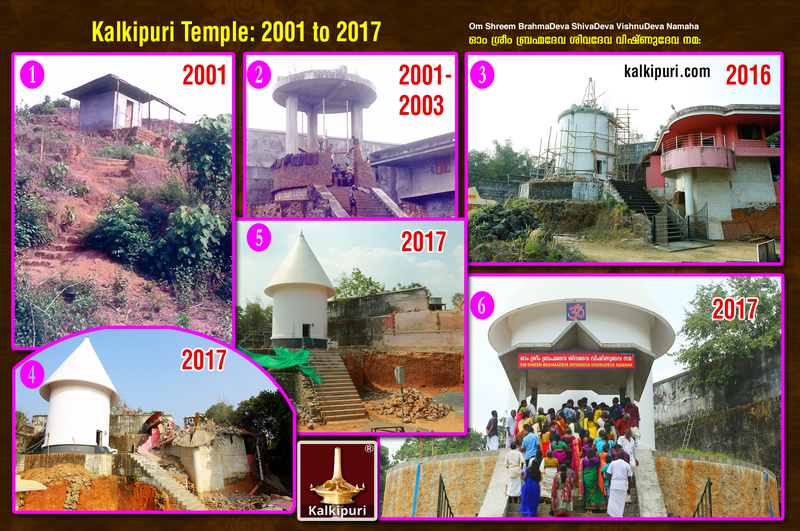 The construction work of the Kalkipuri Temple will be completed at the earliest. Kalki will execute it upto a stage with the co-operation of those presently included then by Lord’s decision, devotees from all over world will participate. Kalkipuri Temple will exist forever to give blessings and protection to the devotees with world fame. Kalki will have many devotees and higher position with dignity. Astrological thinking of Kalki is equal to the Astrological thinking of Lord Shiva. Virtue intended conscious of righteousness ( Dharma is Equilibrium ) exists in Kalki. Kalki have the protection of paternal that possess truth, virtue and mercy. Kalki will be respected by those at higher positions. Such divine greatness of Kalki is most important because of the highest position of ninth bhavadipathi in Jupiter lagna. Gold was placed in the house of Venus (Shukra Kshethram). As the astrological ascendant sign of the zodiac is same as Venus and however it gets destroyed, Kalki has the divine power to bring it back to strength. All these lead to prove that Kalki has self enlightening divine power. It is self enlightened because it is inborn zodiac. The importances of Venus shows its power to raise it back again even if it is destroyed, like when a wild fire comes and destroy all things, again it sprouts out with rain falls. The highest position of Jupiter is its expressive evidence. Kalki has the authority for everything especially for giving divine protection. Cancer is also the zodiac of Kaliyuga. The end of one and the starting of another, creation after a flood situation, also a transformation that could happen, are shown by the zodiac Cancer and highest position of jupiter. Kalki has the divine power of parakaya pravesha – It is transmitting one’s own soul to another body. But all these are for divine purposes and happen only as per the decision of Kalki. To get a tumbler of water from Kalki is similar to the effect of nectar (Amruth). The highest position of Jupiter shows that Kalki has divinity to cure diseases which even the doctors could not cure. The above details are the important parts revealed by astrologers about Kalki in Swarnaprashnam held on 7th & 8th April 2003 and Thamboolaprashnam held on 20th June 2003.